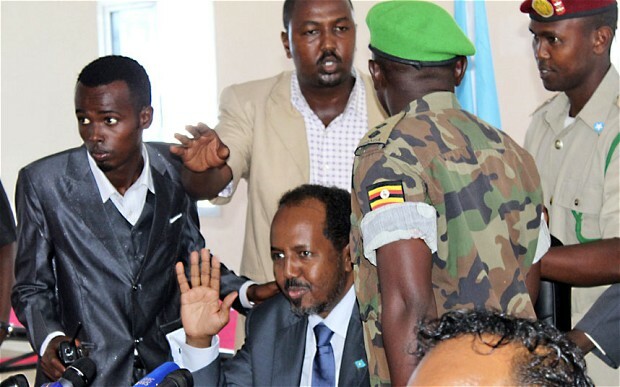 JNN 23 Feb 2014 Mogadishu : Somalia’s President Hassan Sheikh Mohamud has survived an assassination attempt following a Suicide attack on the presidential palace in the capital Mogadishu. Two al-Qaeda-linked bombers yesterday struck a Mogadishu hotel where Somalia’s new president, less than two days in office, was giving a press conference, killing eight people. Hassan Sheikh Mohamud, the country’s newly elected leader, escaped unharmed along with Kenya’s foreign minister, Sam Ongeri, who was attending the same event. According to Police Captain Mohamed Hussein, the gunmen launched the attack with a car bomb, and then a gunfight erupted between guards and the assailants. Al-Shabaab, Somalia’s Wahabi Terrorist Organization , said that it ordered the strike, less than 48 hours after Mr Mohamud was selected as the country’s first post-transition president. “We were behind the Mogadishu hotel blasts. It was a well-planned Mujahideen operation,” said Sheikh Abdiasis Abu Musab, a spokesman for al-Shabaab’s Terrorist Wing . Eight people – including three Somali soldiers and two from the African Union peacekeeping force stationed in the country – died in the twin blasts, which targeted the Jazeera Hotel, Mr Mohamud’s temporary residence. “One of the bombs was a suicide blast which targeted to the gate of the hotel while the other one was a car suicide Blast which caused several casualties,” said Ibrahim Yahye, an eyewitness at the hotel. “The troops opened fire after explosions, there was also other casualties but I can’t tell you figures.” Speaking briefly to reporters, Mahomud said that his government will secure the security of the country. In addition, another police officer said a second explosion was heard during the assault. Police said at least 14 people were killed in the attack, including five Somali officials or soldiers plus nine assailants. The hotel is close to Mogadishu’s heavily-fortified airport compound, which is a major base for international diplomatic staff and AU troops and the surrounding area is considered one of the safest parts of the coastal city. Somalia’s al-Shabab Terrorist later took responsibility for the attack on the palace, which is the residence of the country’s president, prime minister and speaker of the parliament. Al-Shabab fighters were driven out of the capital and other major towns by the UN-mandated African Union Mission in Somalia (AMISOM) – which is made up of troops from Uganda, Burundi, Djibouti, Sierra Leone and Kenya. The group, however, remains in control of large parts of rural areas in southern Somalia and continues to carry out attacks on the foreign troops in the country. Earlier in the month, the United Nations refugee agency raised concerns over the rising number of Somalis forced to leave their country as a result of violent clashes between government forces and al-Shabab fighters. This entry was posted in AFRICA and tagged Al Shahab, Hassan Sheikh Mohamud, Mogadishu, mogadishu somalia, Police Captain Mohamed Hussein, President Hassan Sheikh Mohamud, Sheikh Abdiasis Abu Musab, Somalia, Terrorist, Wahabi. Bookmark the permalink.